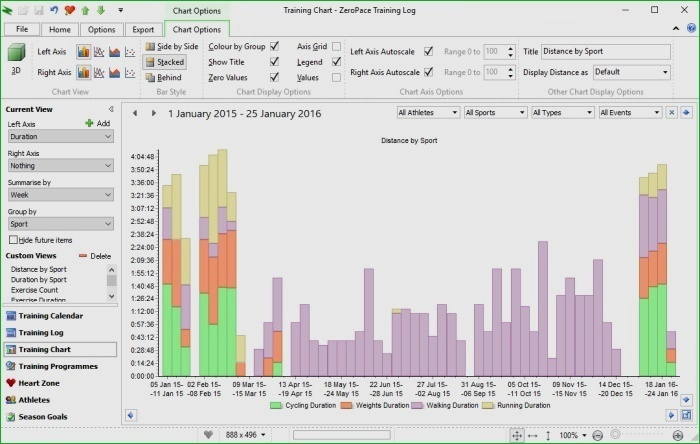 The Windows Training Log is ideal for coaches, athletes and fitness enthusiasts who need to track everything from time and distance, to advanced training information such as heart rate data, and perform analysis for training programme effectiveness. Can be used for sports including triathlon, duathlon, cycling, running, swimming, rowing, aerobic classes, weights and many more. Also interacts with our Mobile and Online services so that you never miss logging a workout. The new Map View allows you to view the route imported from your fitness device. GPS data can also be exported to Google Earth for additional viewing options. 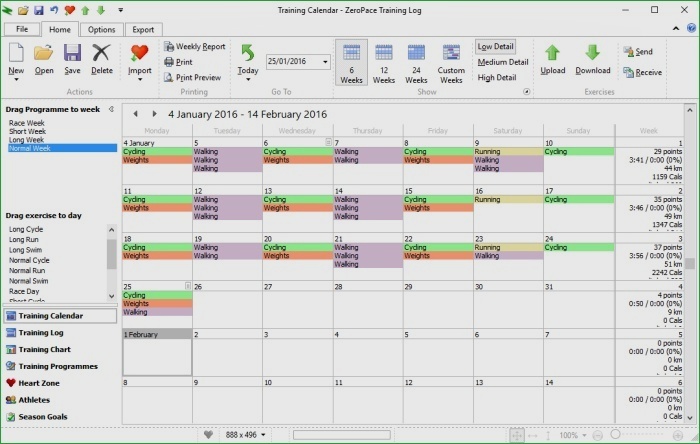 The Calendar allows you to plan out your training and racing, and, can be changed quickly to view anything from one week up to an entire year. You can create weekly training programmes, these are made up of a number of exercises, and can be quickly dragged onto the Calendar to schedule them. Training Periods can be defined that cover the Preparation, Base, Build, Taper, Race and Recovery phases of your season. The Chart allows you to display various aspects of your training, racing or personal statistics in graphical form. This can include weekly cycle distance, monthly running duration, target vs actual weekly hours, multi-sport points, yearly summaries, etc. The Log view shows a list of all exercises that have been entered. 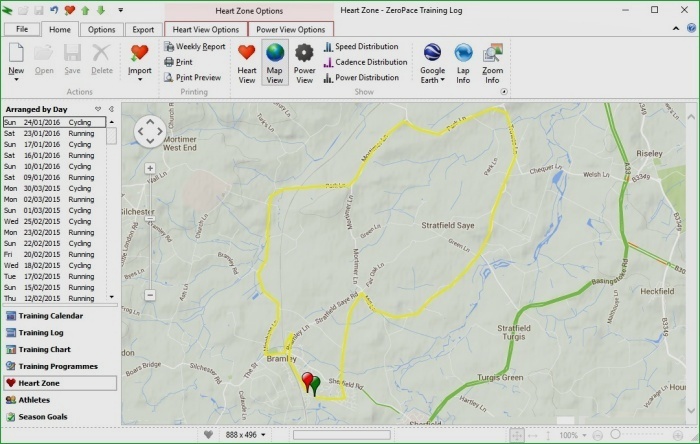 You can create Favourite Log views that show only the information you are interested in, such as distance covered, calories burned or summarised heart rate information. You can also filter, group, sort and summarise the exercises to produce reports. 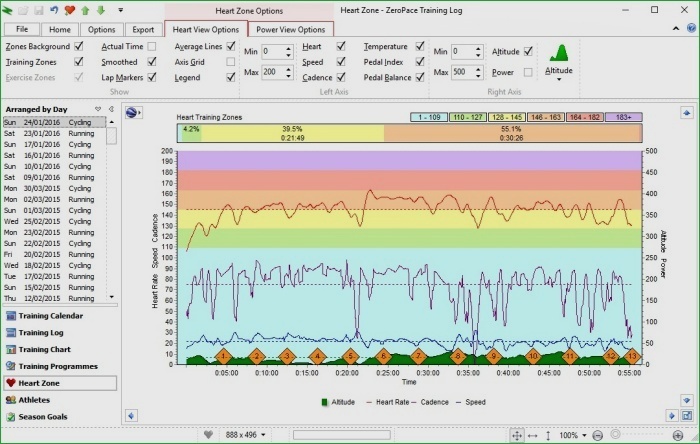 The Heart Zone allows you to view your heart rate and power data as well as other telemetry such as speed, cadence and altitude from your fitness device. For some devices you also have sub-charts showing percentage time spent in your heart and power training zones and exercise zone. Heart rate data file imports exists for selected devices from Polar, Garmin, Timex, Power Tap, SRM, Suunto, Specialized, Tacx, Ciclotour, CompuTrainer, Cateye, Kettler Tour Concept, iBike, PoolMate and Moxy. The following Polar devices are supported via IR: Polar CS400, Polar CS600, Polar RS400, Polar RS800, Polar S610, Polar S610i, Polar S625X, Polar S710, Polar S710i, Polar S720i, Polar S725, Polar S725X, Polar S810, Polar S810i, Polar AXN500, Polar AXN700, Polar E600 and Polar F55. The following Polar devices are supported via SonicLink: Polar F6, Polar F11, Polar CS100, Polar CS200, Polar CS300, Polar RS100, Polar RS200, Polar s410, Polar s510 and Polar s520. Not all Polar devices record heart rate, speed, cadence, altitude, power, temperature or route data for the exercise, please consult the Polar documentation for details. Garmin devices that ship with the Garmin Training Centre Software that includes the ANT Agent, such as the ForeRunner 405, are supported by our Garmin Automatic import. The ZeroPace Training Log Agent will automatically detect new Garmin files imported by the ANT Agent and start up the ZeroPace Training Log, if required, and import the latest Garmin file. An internet connection is required to view GPS route data in the ZeroPace Training Log. A Google Earth export function with additional viewing options is also available in the ZeroPace Training Log. Polar HRM files, Garmin HST, TCX, FIT and Connect files, Suunto SDF and FBE files, Timex CSV and PWX files, PowerTap CSV files, SRM TXT files, Specialized SLG files, CompuTrainer TXT files, Tacx RTF files, CatEye CSV files, Ciclotour TXT files, Kettler Tour Concept CSV files, iBike CSV files, Swimovate PoolMate Pro files and Moxy Monitor files.